The Midwestern United States has built quite a pipeline to Mesa High School in Mesa, Arizona over the past five years. First it was 6’4 guard Graham Hatch, who now starts for Wichita State University in Kansas. Three years later, the University of Iowa came in and plucked Arizona’s State Player of the year, in 6’7 forward Aaron Fuller (who is starting as a sophomore). Following Fuller, the University of Tulsa nabbed nationally 6’1 ranked point guard Donte Medder in the 2009 class. 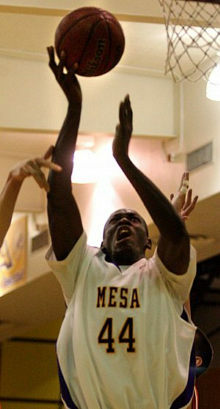 Having maintained that connection; the University of Tulsa offered a scholarship to Mesa High’s, 6’9 Forward/Center Blondy Baruti, who was a teammate of Donte Medder. Baruti, a native of the Democratic Republic of Congo, is rated the 23rd best center in the country by ESPN and was rated as one of the ten most impressive players Frank Burlison saw in Las Vegas this summer. Burlison is one of the most highly regarded West Coast basketball scouts. It was after that same tournament in Las Vegas, when Baruti’s recruitment sky-rocketed. The University of Tulsa offered him a scholarship and beat out several other Universities including Missouri, San Diego State, Georgia Tech, Boise State, and Northern Colorado. Baruti, the most intimidating big-man in the state of Arizona, is primed and ready for a break-out senior season. He will be able to play in all region games, as well as the Mesa High vs. Mountain View showdown at the MLK Classic at Arizona State University on January 17th. He will also be available for postseason play.